Small to medium-sized manufacturers (SMEs) must improve productivity by unlocking ‘their own hidden potential’, if sales and profits growth is to meet expectations – according to the latest National Manufacturing Barometer. The quarterly survey, which is conducted by SWMAS (part of Exelin Group) in partnership with Economic Growth Solutions (EGS), invited 320 manufacturing industry leaders to discuss performance, with a special focus on productivity and the extent to which it is engrained in manufacturing business culture. An overwhelming majority of respondents (72%) said they anticipate an increase in sales in the next six months – the highest figure recorded for nearly three years. In a further indication of confidence in the sector, 59% of respondents said they were expecting increased profits over the next six months. However, as only 45% of manufacturers actually experienced increased profits in the second half of 2017, the gap between anticipated sales growth and actual recent improvements in profits continues to raise questions about productivity, especially the ability of manufacturers to meet their own growth targets. Encouragingly, more than half (56%) of manufacturers indicated in the Barometer that they aimed to deliver against their growth targets by investing in machinery and premises; a rise of 13% on the last report. Furthermore, 48% of respondents to the latest survey said they planned to recruit new staff, which is only 2% higher than the same time last year. This suggests that improving productivity through the existing workforce and facilities remains the key focus. Around 70% are confident that productivity is ingrained at a strategic level, and championed by business leaders. However, almost half indicated they would like to achieve better, and sustainable, productivity improvements, pointing to the need to improve engagement with staff to deliver and sustain change. “The Barometer does, however, demonstrate there is a definite gap between many manufacturers’ expectations about future performance and their ability to deliver the productivity gains required to drive sales and profit growth. Dean Barnes, Regional Director of Economic Growth Solutions and the Manufacturing Growth Programme, added: “This Barometer delved deeper into how manufacturers are tackling the productivity puzzle and it’s hugely positive to see that more respondents are planning to invest in machinery and premises, and around half are committed to recruiting staff. Michael Gibbs, Managing Director of Redruth-based spring manufacturer European Springs & Pressings, said: “These findings speak volumes. To have two thirds of UK SME’s forecasting continual growth in their order books – alongside increasing profits – confirms the UK’s recent rise up the rankings to the eighth largest manufacturer in the world. This survey covers the business operating period for winter 2017 (October, November and December 2017) with businesses surveyed in January 2018. UK SME Manufacturers wanting to add their voice can sign up to contribute to the next Manufacturing Barometer at www.swmas.co.uk/knowledge/manufacturing-barometer. 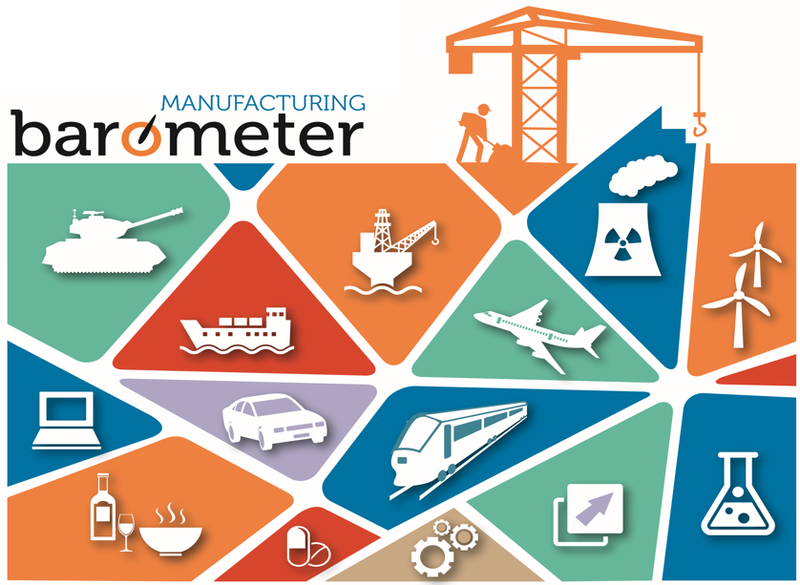 www.manufacturinggrowthprogramme.co.uk/market-intelligence/#manufacturing-barometer or follow @mfggrowthp on twitter.